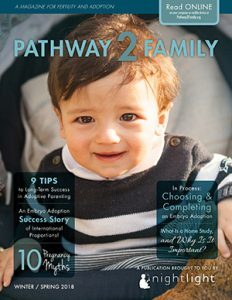 Why Should We Add Embryo Adoption into Our Adoption Agency Program? There are many children in the United States and throughout the world who have already been born and need a family. Why worry about frozen embryos? Thanks to Assisted Reproductive Technologies, couples throughout the U.S. are now faced with the decision of what to do with embryos they have remaining from IVF. They realize the embryos are lives with potential - not potential lives - and they want to help another couple build their family. On the other hand, infertile couples may like to pursue in vitro fertilization (IVF) but cannot afford it. Perhaps they tried IVF - even several times - but were unsuccessful. Perhaps they have even adopted successfully domestically or internationally. Embryo adoption provides another great option for these hopeful parents and allows you to add to your agency’s services. Learn more about educating your clients, download brochures, and explore our agency FAQs by navigating the left-hand menu.